Was The American (US) Constitution Really Based on Biblical Principles? Did the framers of the Constitution of the United States really base the Constitution upon the Bible and biblical principles? George Mason, another of this nation’s founding fathers wrote “The laws of nature are the laws of God, whose authority can be superseded by no power on earth.” Benjamin Franklin insisted on prayer before each session of the Constitutional Convention and Franklin obviously must have read enough of the Bible to have said “I have lived, Sir, a long time, and the longer I live, the more convincing proofs I see of this truth – that God Governs in the affairs of men. And if a sparrow cannot fall to the ground without his notice, is it probable that an empire can rise without his aid?” John Adams wrote to his wife Abigail in a letter dated July 3, 1776 in which he said “The second day of July, 1776, will be the most memorable epoch in the history of America. I am apt to believe that it will be celebrated by succeeding generations as the great anniversary Festival. It ought to be commemorated, as the Day of Deliverance, by solemn acts of devotion to God Almighty. 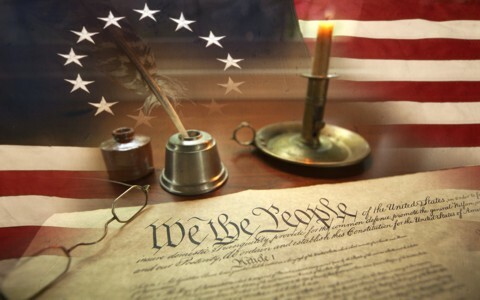 It ought to be solemnized with pomp and parade, with shows, games, sports, guns, bells, bonfires and illuminations, from one end of this continent to the other, from this time forward forever.” Thomas Jefferson wrote “God who gave us life gave us liberty. And can the liberties of a nation be thought secure when we have removed their only firm basis, a conviction in the minds of the people that these liberties are of the Gift of God? That they are not to be violated but with His wrath? Indeed, I tremble for my country when I reflect that God is just; that His justice cannot sleep forever; That a revolution of the wheel of fortune, a change of situation, is among possible events; that it may become probable by Supernatural influence! The Almighty has no attribute which can take side with us in that event” (Notes on the State of Virginia, Query XVIII, p. 237). Tragically, these things have been left out of the history books now being fed to our younger generation. What would the anti-Christian history revisionists say about these factual historical statements of the founding fathers? It’s interesting that the First Amendment that was designed to protect religious freedom and liberty is now being used to restrict it. This is not what the First Amendment says as we read “Congress shall make no law respecting an establishment of religion, or prohibiting the free exercise thereof.” Now it seems that it reads “The U.S. Supreme Court shall make sure no laws respect the establishment of religion but should prohibit the free exercise thereof” and instead of being any separation of church and state it has become separating the church from the state, which was not the intention of the Constitution at all. In fact the phrase “the separation of church and state” is not found in the U.S. Constitution, it is not found in any of the Amendments, nor is it found in the Bill of Rights. This term came from Thomas Jefferson’s statement about a wall of separation between church and state but it was made in a letter on January 1, 1802 to a church (the Danbury Baptist Association of Connecticut). The congregation heard a widespread rumor that the Congregationalists, another denomination, were to become the national religion, which was blatantly false. This was very alarming to people who knew about religious persecution in England by the state established church. Jefferson made it clear in his letter to the Danbury Congregation that the separation was to be that government would not establish a national religion or dictate to men how to worship God and not that the expression of religion was to be restricted or removed from the government or the public square nor from the public education system. The fact is that the very first colleges and universities were essentially seminaries which trained men in biblical morality. It would seem ridiculous to believe that this nation was not founded on Christian principles by Christian men because there are five clear references to God in the first three paragraphs of the Declaration of Independence. So to the framers of the Constitution, the idea of having a government not based on God would have been unthinkable because all of the delegates at the Philadelphia convention were creationists. On the day that Congress finished its work on the First Amendment, it called on President George Washington to issue a Proclamation to the people of the United States to thank God for the freedoms we enjoy. A week and a day later the President’s opening paragraph in his Proclamation said: “Whereas it is the duty of all nations to acknowledge the providence of Almighty God, to obey His will, to be grateful for His benefits, and humbly to implore His protection and favor.” Early on, there was vigorous debate about whether the word “God” should be added to the Constitution but it should be known that the debate was between one group of creationist’s verses another and in fact, almost no believed that the United States was a godless country just because the word “God” was not in the Constitution. There is not one solitary fundamental principle of our democratic policy that did not stem directly from the basic moral concepts as embodied in the Decalog and the ethics of Jesus. From those who believed that Thomas Jefferson was a deist, read what he wrote in his “The Writings of Thomas Jefferson.” “I am a real Christian – that is to say, a disciple of the doctrines of Jesus Christ” (p. 385) and Benjamin Franklin who wrote in his letter to Ezra Stiles, then the president of Yale University, “Here is my Creed. I believe in one God, the Creator of the Universe. That He governs it by His Providence. That He ought to be worshipped” (March 9, 1790). It is crystal clear that this nation was founded by Christians and with Christian beliefs, morals, values, and ethics and these same men wrote the U.S. Constitution. The overtones of the Constitution are inherently Christian in nature and even if there is no mention of God per say, it is obvious that the framers where rock solid, Bible-believing, disciples and followers of Christ. Of that we can be absolutely sure. Take a look at this related article: Was the United States of America Founded as a Christian Nation? As usual, I enjoyed this article very much. My husband, raised pentecostal though not practicing any religion at this moment, was discussing with me how our founding fathers would be rolling in their graves if they could at the blatant falsehood politicians and other members of society used the constitution to put forth their own selfish ambitions and/or agendas. It is awful but if all these things that are happening, didn’t, then the Kingdom of God would never arrived. May everything that happens today be only because God in His all-knowing, omnipotent way allows it. Amen my sister in Christ. This isn’t right that we are re-writing history to kick God out of it….just like every other place. Thanks for the encouragement my friend. Your husband is spot on the mark. I work with a Christian organization (Eastern European Mission) that among its efforts places Bibles in public schools. A key Ukrainian official told us, “a nation can not cleanse itself until it takes up the scriptures”. This attitude is why over 4 million public school students are studying God’s Word everyday in Eastern Europe and their grades are up while discipline problems are down. Let us all pray America returns to this realization. So true. Praying for Ukraine. Amen to what you or the Ukrainian official said. Previous post: What Are The Gates Of Hell? What Does The Bible Say? Next post: What Are The Twelve Tribes Of Israel?